BRIGHOUSE have dropped to third from bottom and could be sucked into a re-election battle after falling at home to Bradford League Second Division leaders Morley. Morley, looking for an immediate return to the top division following last season’s relegation, are now set for promotion with just one loss all season to date. Visitors Morley showed immediately why they are top of the division after being put into bat. They were 79 before the loss of Richard Judd, bowled by Nadim Hussain. Eleven runs later, fellow opener James McNichol was caught behind. Kriss Watts was joined by captain Mathew Baxter and they put together a partnership of 61, taking their side to 151 before Sohail Hussain trapped Watts lbw for 34. A small victory for the home side, albeit bringing to the fore overseas player Kashif Naveed. In conjunction with Baxter they gave no chances as each achieved a century as they put on 178 to finish on 329-3, Baxter making 108 not out and Naveed an unbeaten 100. 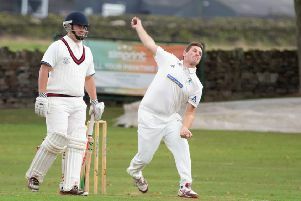 Brighouse used eight bowlers looking to change approaches and line to upset the pairing but to no avail. Points were now the order of the day for the home batsmen. Wajid Hussain opened with Awaise Hussain in the absence of Zahir, away on work commitments, and had the task of setting the tone for the reply. Mathew Dowse, hitting the track hard, had Wajid fending a catch to Watts and it was 6-1. Khurshid, forever positive, quickly found the boundary with a four coupled to five quick singles before Dowse put in another good length ball and James McNichol snapped up the catch to make it 23-2. Awaise plundered two boundaries before fellow opening bowler Nathan Bromby had him caught by Kashif for nine, leaving Brighouse 37-3. The theme was set, Dowse (5-37) and Bromby (3-35) producing fine stints of medium-quick, line and length bowling backed by some fine catching. Sohail (10), Zahid (19), Nadim (10), captain Matharu (16) and new player, Brighouse Old Boys footballer Calvin Lee (16), stepping up from the seconds with a creditable knock, all perished as Brighouse were dismissed for 106 in 36 overs, claiming just one point for their efforts. Keighley are 14 points clear of Brighouse after defeating Windhill, who are just one point behind them. Andy Wear’s 43 for Keighley was important, taking them to 161 before Windhill fell for 151. Wray’s 138 led Yeadon to 273-7 against bottom club Idle, who reached 212-4 through 71 from Bhogal and captain Simon Curry’s unbeaten 80. Second-placed Scholes defeated Spen Victoria by nine wickets after the pace of Yasir Ali (7-26) sent Spen to 70 all out. Hartshead Moor, whom Brighouse meet on Saturday, won by eight wickets afterDanny Squire’s 6-27 sent Bankfoot to 77 all out.